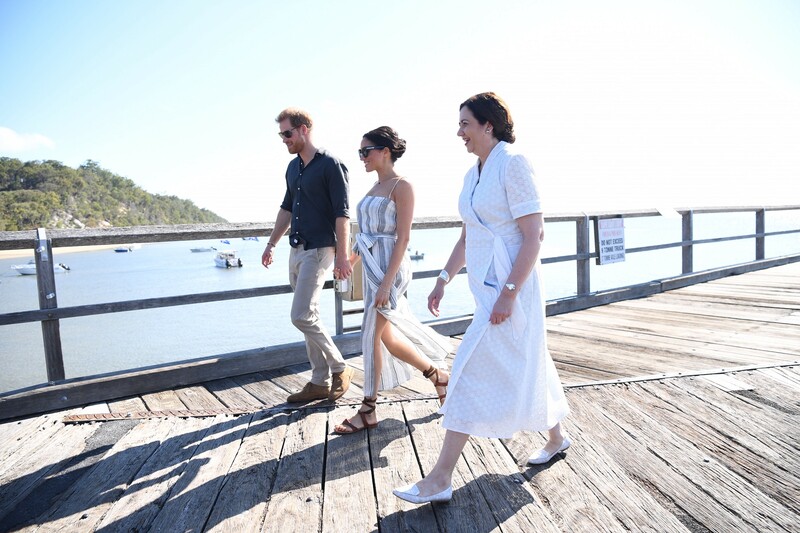 Today, Queensland did what it does best and bathed the Duke and Duchess of Sussex in a spectacular 26-degree glow of sunshine and a series of warm and welcoming low-key events on Fraser Island, the world's biggest sand island. Despite scaling down her official appearances to relax, the Duchess of Sussex continued to make her way to the world-heritage listed island, separating from Prince Harry at the Hervey Bay Airport, and boarding a whale watching boat, Tasman Venture, for a picture-perfect bay crossing. Hailed as a resting spot and a nursery for Humpback Whales and their calves as they migrate south, it is quite common to spot the giant cetaceans during the bay crossing this time of year. K'gari, the traditional name of the island means “paradise” in the local Butchulla dialect and is a top pick for any expectant mum looking to relax. Kingfisher Bay Resort, where the Duchess of Sussex spent time resting, offers an inhouse spa with pregnancy-approved treatments, including Ocean Song, a 110-minute scrub, massage and facial using native Australian ingredients. The resort also offers a Bush Tucker and Bush Medicine tour and a Living Art Gallery. The artist featured in the gallery is Peter Meyer, a Kingfisher Bay Island Resort guide, a long-term resident of the island and a noted photographer. Today the Duke and Duchess of Sussex were presented with one of his most popular photographs, a striking image of the island's rainforest, as a souvenir of the royal visit. In an interview with Nine News, Mr Meyer said, “They are going to Pile Valley where the Satinay trees are, so I gave them a photo of the valley as a reminder. 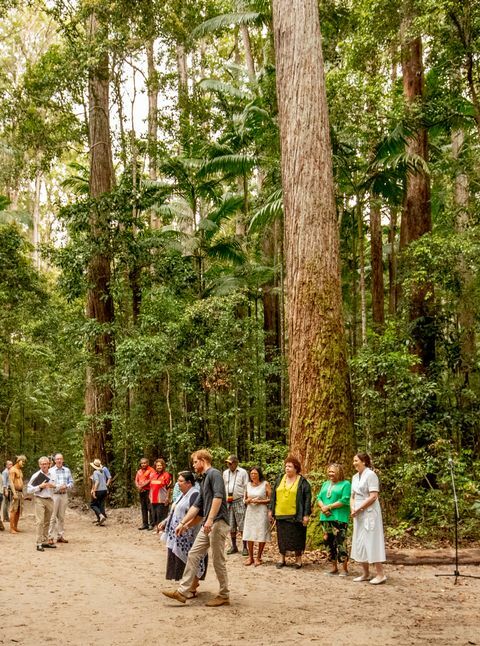 Meanwhile, Prince Harry took a Fraser Island Explorer Tour Bus to River Heads where he boarded the public barge for a 45-minute crossing to Fraser Island. His first stop was Pile Valley, the only rainforest in the world that grows out of the sand, with towering 50-metre tall Satinay trees. There he unveiled a plaque signifying the area as part of the Queens Commonwealth Canopy Initiative, a project to raise awareness of forests and preserve them for the future. 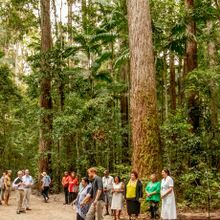 K'gari is the first area (in Australia) to be recognized under the Queens Commonwealth Canopy Initiative, with 200,000 acres now under protection. 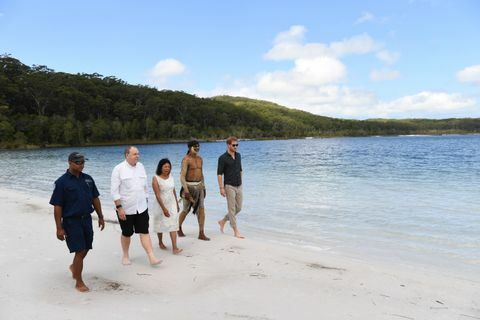 Prince Harry's second stop was the iconic Lake McKenzie, a pristine lake some 85 metres above sea level, where a local Butchulla elder performed a moving welcome-to-country ceremony dipping foliage into the crystal-clear water and washing the Prince's bare feet. Lake McKenzie, which means “waters of wisdom” in Butchulla dialect, is considered sacred. Hugely popular with global travellers, it is one of more than 40 perched lakes on Fraser Island filled with rainwater so fresh and pure it was prized as drinking water by the traditional land owners. Prince Harry walked along the fine silica sand wading bare feet into the shallows of the water and cupping his hands to drink from the lake. The Prince transitioned to the Tasman Venture boat for lunch before the highlight of the day, rejoining his wife, the Duchess of Sussex, for a public meet and greet along Kingfisher Bay Jetty in front of Kingfisher Bay Resort. 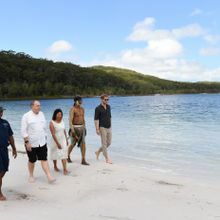 A nervously excited Kingfisher Bay Resort General Manager David Hay said it was a huge honour for the resort, the island and for Queensland to welcome the royal couple. The Duke and Duchess of Sussex's visit was the second royal visit to Fraser Island, following Prince Charles visit in 1992. With news of the royal pregnancy so fresh in the public mind, tourists couldn't help but wonder if the world-heritage listed island would inspire the naming of the royal baby. For a girl, some tourists recommended McKenzie, Sandy, Forest, or Rain. For a boy, there was only one choice: Fraser. For images and videos: https://bit.ly/2OG8miE. Please credit photographers.